A secret, underground group of unlikely heroes. A hunt through a creepy, dilapidated mansion. A harrowing escape in a snowstorm. Does this sound like the making of a great movie thriller to you? It is. It has a fair share of warmth and humor, but at its core, Disney's animated adaptation of Dodie Smith's book has all the elements of a classic suspense thriller--only with animals. Pongo and Perdita are the proud new parents of 15 dalmatian puppies. Together with their human "pets," Roger and Anita, they live a quaint lifestyle in London, where Roger works diligently at becoming a successful songwriter. Their lives are turned upside down, however, when an old school chum of Anita's, the appropriately named Cruella De Vil, becomes obsessed with the puppies (she longs for a--gasp--dalmatian fur coat) and masterminds their kid--er dognapping with the help of her bumbling henchmen, Horace and Jasper. From there, the search is on as Pongo, Perdita and a bevy of animals in the English countryside band together and risk their own skins to save the pups. Never underestimate the power of a "Twilight Bark." Cruella is one of Disney's greatest villains. Her commanding figure is gaunt and skeletal, but her hair and fur coat are broad and bushy. She's the loudest person in the room at all times with smoke perpetually billowing from her ever-present cigarette holder. She was animated by Disney Legend Marc Davis, who previously drew Tinker Bell for Peter Pan. 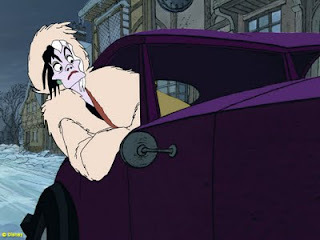 Cruella would be his last, crowning animation achievement. Davis would go on to enjoy a terrific second act as a Disney Imagineer (Pirates of the Caribbean, anyone?). 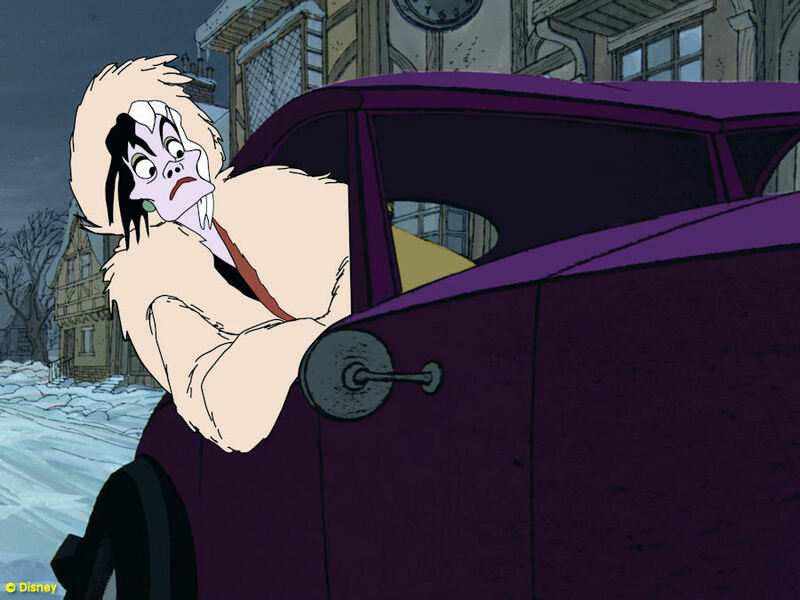 If you're going to cap an animation career, Cruella De Vil isn't a bad way to do it. 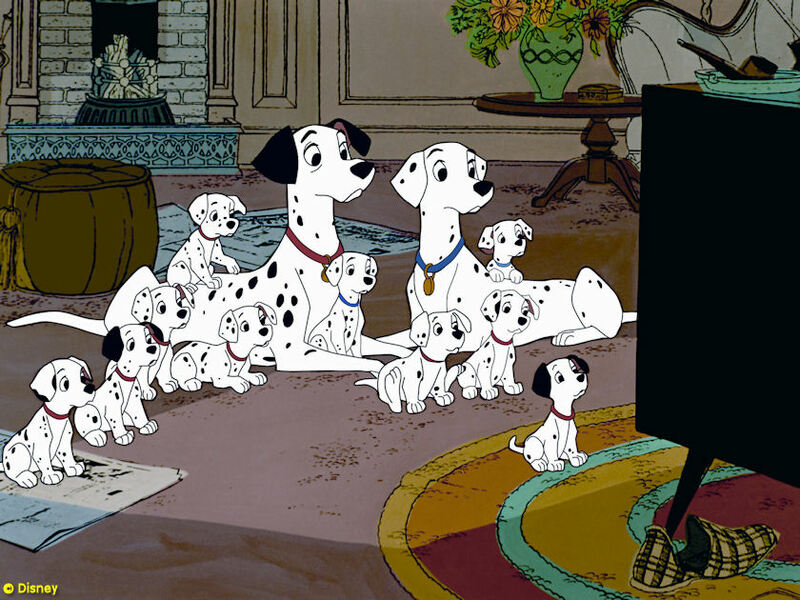 Her bigger-than-life presence is the energy that drives 101 Dalmatians, Disney's best thriller. This is part eight of my 30-day Disney movie challenge. Tomorrow, bring a spoonful of sugar to enjoy my favorite Disney musical. I need to watch this again. It's been a while. A month, I think. Love it!